Big cap diversified miners are riding a wave of optimism as global growth prospects – especially in manufacturing – continues to strengthen. Global economic activity as measured by the JP Morgan global manufacturing and services index showed output rising at the fastest pace since March 2015. Copper, a barometer of economic activity thanks to its widespread use in transportation, construction, manufacturing and power infrastructure, exchanged hands for $3.23 a pound or $7,120 a tonne on Friday, bringing the bellwether metal rally from multi-year lows at the start of 2016 to 66%. The rally for zinc has been even more spectacular with the metal, mainly used to galvanize steel, setting a fresh decade high on Friday of $3,354 a tonne. Zinc has more than doubled in value after a prolonged slump that ended around the same time copper hit bottom two years ago. The iron ore price which has been defying expectations of a downturn gained again on Friday with benchmark Northern China import prices jumping to the highest since September to $77.10 a tonne, up 34% in fewer than three months. The steelmaking raw material bottomed at $37 in November 2015. Premium export coking coal was at $261.70 a tonne, levels last seen in April last year when Cyclone Debbie halted Australian exports. Coal used in steelmaking bottomed just over two years ago at $73. Perhaps the most surprising recovery is in thermal coal which was back in triple digits on Friday with Newcastle futures trading at $104 a tonne – two years ago coal for power generation was in the low $40s. The bullishness is even more evident in share prices of sector heavyweights with investors piling into stocks that were decimated at the bottom of the cycle. Shares in world number one miner BHP (NYSE:BHP) has more than doubled the past two years and the company is now worth $121 billion in New York. The Anglo-Australian giant is worth an eye-popping $75 billion more than two years ago, despite spinning off non-core assets into South32, itself a top 20 mining company, along the way. Vale (NYSE:VALE), the world's top iron ore and nickel producer, is up fourfold since the bottom of the cycle at the beginning of 2016. 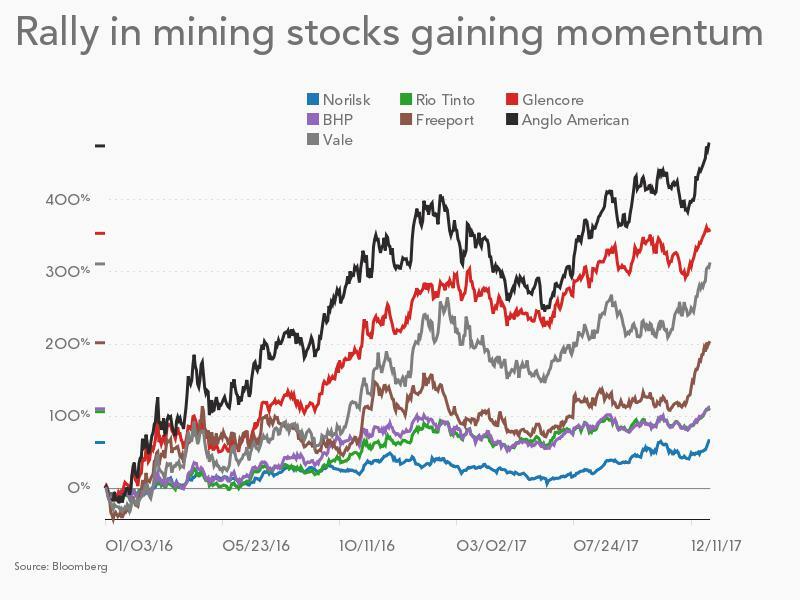 Russia's top mining company Norilsk Nickel (MCX: GMKN) is the underperformer among the top tier, but the company which has benefitted from a record high palladium price still added two-thirds in value since the cycle turned. The world's second largest miner based on revenue Rio Tinto (NYSE:RIO) has doubled. The Melbourne-HQed company is the world's number two iron ore producer and number seven copper producer. Obituaries were being written for Anglo American (LON:AAL) two years ago before the 100-year old company went on radical restructuring drive. Since then the world's fourth largest diversified miner has surged 477% in value approaching a $30 billion market cap. Top listed copper producer Freeport-McMoRan (NYSE:FCX) which regularly features among the NYSE's most actively traded stocks has added more than 7% just this week and is up 40% over the past month. The Phoenix-based company is in the midst of arduous talks with the Indonesian government about the future of its iconic Grasberg mine and since giving up its oil and gas assets Freeport has become one of the best ways to play copper. 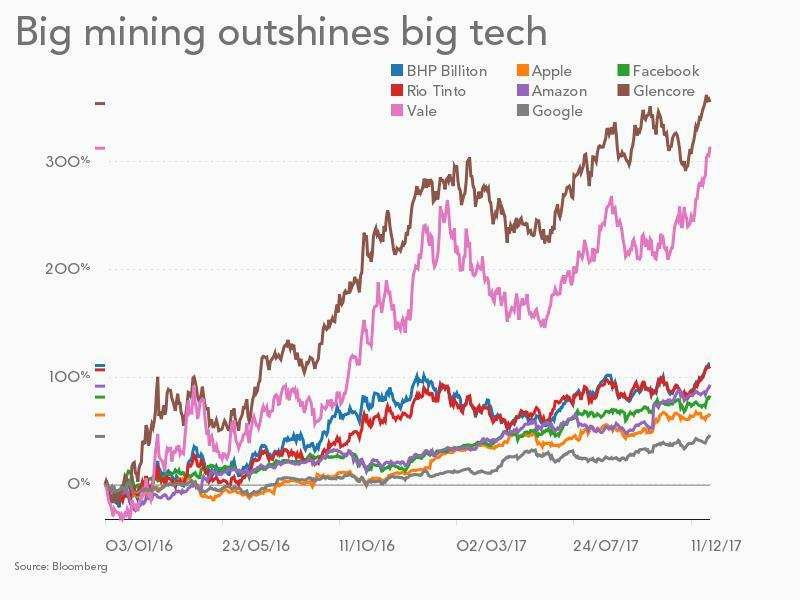 Glencore (LON:GLEN) is the world's third most valuable mining company with a market cap of $76 billion thanks to a 355% gain over two years. Number three in copper, number one in cobalt – the best performing metal over the past year – and a major producer and top trader of coal, the Swiss giant made the most of the upturn despite having no exposure to iron ore.